High density polyethylene pumps are ideal for water, water-based liquids, detergents , and even some petroleum products. Simple foolproof operation. Pump( squeeze) bellows to start flow. 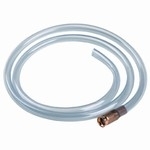 Control siphon action with air vent in handle. Drum pump is 34" long, ( 55 gallon length), but the suction tube is easily trimmed to fit all size drums . Supplied with threaded bung adapter( 63 mm buttress size available, see Pump2) and 48" X 7/8" output hose.